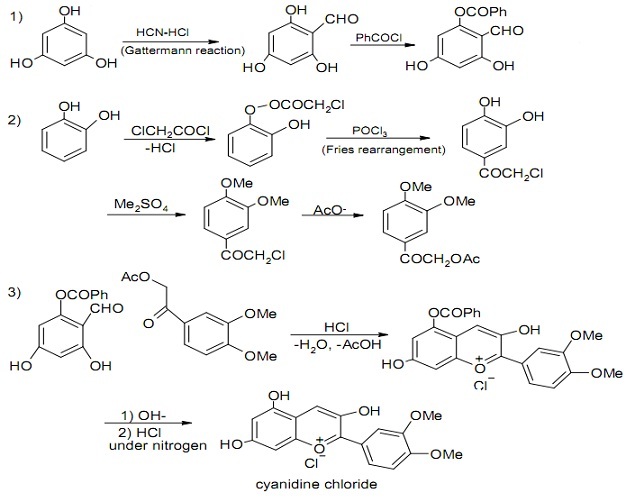 There are many illustrations of benzopyrilium salts, Benzopyrones and benzopyranones and often they have trivial names that reflect their long history (figure shown below). Most of the natural products and frequently such compounds have hydroxyl or alkoxy groups (at times in the form of a sugar residue). 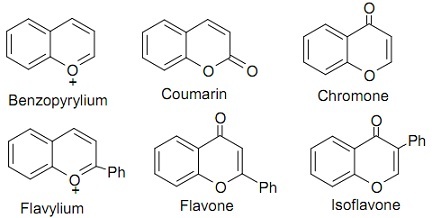 Polyhydroxylated natural products based on 2-phenylbenzopyrilium (or Flavylium) salts and with ether linkages to sugars are known as anthocyanins, while without their sugars they are termed as anthocyanidins. Anthocyanins, in association by other compounds, like flavones, are responsible for the colour of several flowers. The anthocyanin found in rose petals is cyanin; it can be isolated as its chloride. The corresponding anthocyanidin, cyanidin, exists as the pentahydroxy salt in the acidic media, however as the pH increases it provides first a quinone and then an anion. Each of such forms has different colours (figure shown below). Other natural products, in the group are built up via ring fusions of various kinds of ring systems. They comprise the garden insecticide rotenone (at times sold in crude form as derris powder, the pulverised bark of the plant Derris elliptica). Salts of the type R3O+X- are usually unstable and can't be isolated unless X- is an especially stable (that is, non-nucleophilic) anion like BF4-. Though, the oxonium salts derived via oxidation of the pyran nucleus are somewhat stable as the cation methods aromatic stabilization energy which is lost whenever an anion bonds covalently to it. The parent member of the series, the Pyrilium ion is made up by acidification of the sodium salt of glutaconic aldehyde at low temperatures (figure shown below). 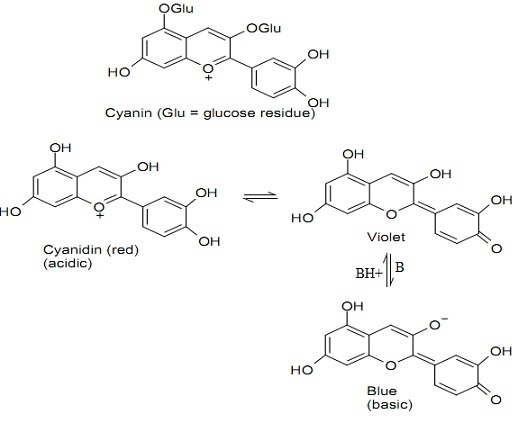 The glycosides of a number of 2-arylbenzopyrlium salts take place naturally as plant coloring matters, the anthocyanins. The parent salts, the anthocyanidins are synthesized from salicylaldehydes and acetophenones via an acid-catalyzed aldol reaction followed via ring closure in the ethylacetate solution. 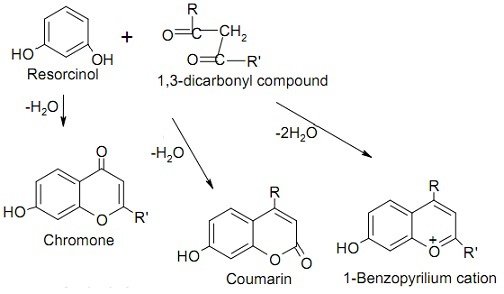 The general process of synthesis of the three ring systems is illustrated in the figure by using phenols and 1,3-dicarbonyl compound as starting materials.